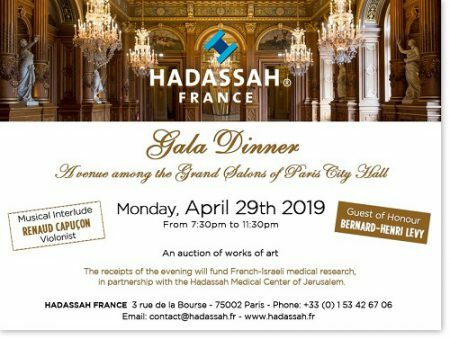 We are delighted to share with you an amazing opportunity to spend a weekend in Paris with Hadassah France. They are hosting a crème de la crème Gala Dinner on April 29th from 7:30 pm, at the stunning Grand Salons of the Paris City Hall with an extraordinary view of the river Seine. The world renowned Bernard-Henri Lévy, a french philosopher, media personality, and author, will be speaking, coupled with a musical interlude from the famous violinist Renaud Capuçon. If you are interested in attending, please contact the Hadassah France office at nicole.cohen @ hadassah.fr or contact @ hadassah.fr .